Exhuming the dreadful powers of the Underworld, Charnel Whispers explores the Maergzjiran Cabal's path of necromancy in a pathworking format designed to guide the Disciple through his or her rites from the basic composition of the death essence fully into becoming a Leiche (Lich); masterfully weaving aspects of death and undeath with ease, controlling the most intimate and destructive of energies known to mankind. Such topics covered are: what it means to be a Necromancer, sylvan necromancy, conjuring various agents of the Underworld, reanimating the dead, controlling the death essence, death curses, grave familiars, Spirits of Keraktes, construction and animation of the golem, and undead apotheosis. 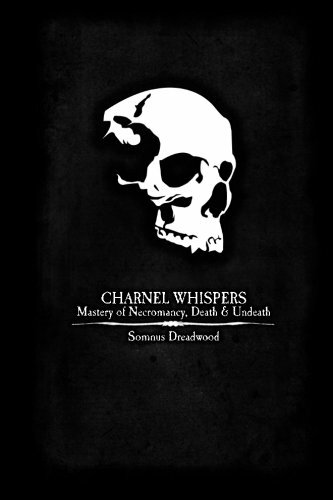 Written by the Master of the Tower of Atrophy, Charnel Whispers enlightens the soul in various means. Of these, the most potent and crucial is that of using "whispers". The Cabal's utilization of whispers almost fully removes the need for ritual components in all manner of rites. Using the most carnal and spiritually powerful parts of the Disciple's soul, all arts of necromancy are manifested before you. Under a moniker paying homage to Roman ancestry and a beloved location where his ritual work was carried out, Somnus Dreadwood is the Ascended Grandmaster of the Maergzjiran Cabal and has equally studied and practiced the occult arts for over 20 years. His spiritual foci include necromancy, demonic invocation, shadowmancy, hexcraft, oneiromancy and divination. Through his years of work within the Cabal, Somnus has introduced many Disciples both within and without the Cabal to a spiritual system focused on apotheosis and self-mastery while further denying the false teachings, misinformation and narrow scope of the Judeo-Christian-Islamic inspired systems so commonly found in the occult.